That's one of the reason for me to start collecting the professional baking books. They always come with basic recipe ingredients for preparing "mise en place". The recipes for making something likes mazipan, fondant, praline and etc., they are important for the professional kitchen. Even though they are easy to find in the market (esp. for bakery shop), knowing how to make them will ensure that they will be able to create their products when the supplier can't deliver the basic ingredients. For home bakers like us, getting some of professional ingredients is not easy in some place and country, I can say "Thailand" -*-, it's not easy for me to find it, so every times that I have a chance I will buy it (a lot) or tell some people to buy it for me, haha. For Pistachio Paste, I ordered it from some shop (on the internet), but after using it a lot lately, I run out of it too. So when my friend asked me where could they find it, I wanted to suggest that shop but I noticed that they stopped selling it too. Now the other's problem becomes my problem too ^^", and we have to solve it together, haha. Because the ingredient for making Pistachio paste is easy to get, and we can make it by ourselves without using special equipment. Making your own pistachio paste is not hard to do, the most time consuming process is taking the skin off, but you will get lovely green paste as the reward ^^. 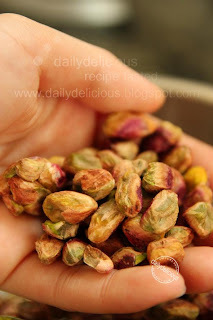 Now you can follow some of my recipes, like Strawberry Pistachio Charlotte, Pistachio Dacquoise or any recipes that need pistachio paste, I know that having all the ingredients that you need will make your baking more fun. 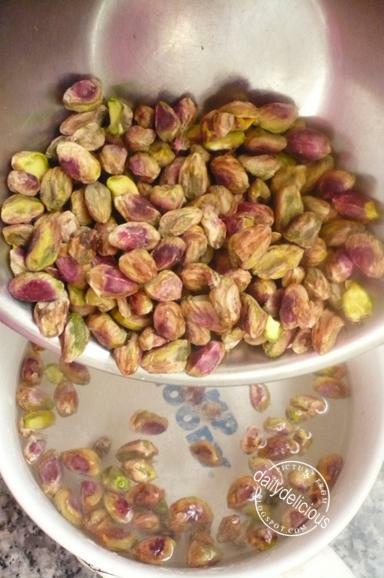 Pour the pistachios into hot water, let the skin soften for 5-10 minutes. 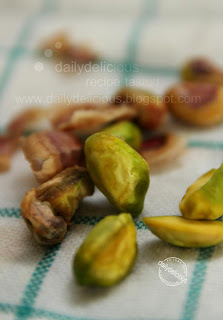 Rub the skin off with clean tea towel, you will get real green pistachios ^^. Roast the nut in 150°C for 10 minutes. Weight the nut, you will need 125g of it. Put the roasted nuts in the food processor with icing sugar. Puree the nut and icing sugar until fine, pour the Kirsh (if you want the paste to be very fragrance use 1tbsp of it) and syrup into the food processor bowl (the amount of the syrup will depend on the moisture of the nut). Process until you get very smooth but not watery paste . Thank you for your suggestion, I wish I can get that too. 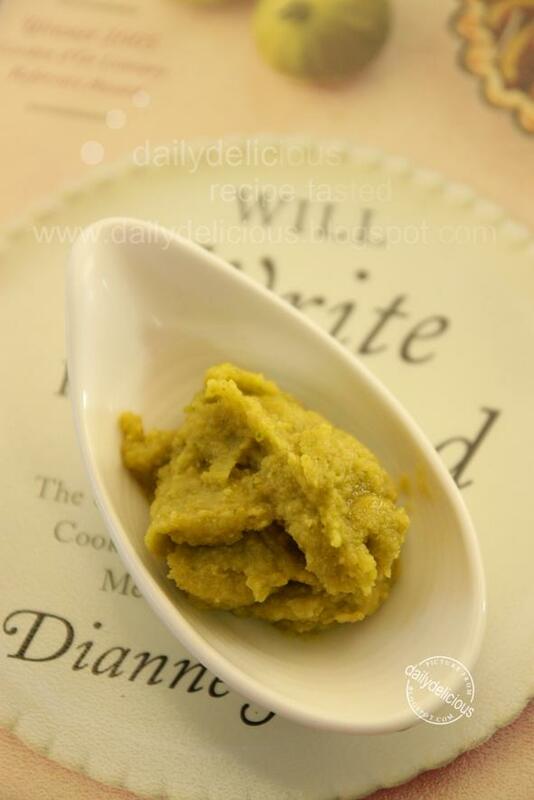 Thanks for sharing this wonderful pistachio paste...fabulous..
oh gosh, sevarome pistachio paste is so expensive!!!! thanks for this recipe! very similar to Jacques Torres' recipe for almond paste! Really ^^, I never know his recipe before. Yes, me, too. Thanks for sharing. I was wondering where to get it while reading your recipe for the Pistachio Dacquoise. ^^ It's my pleasure, I know that we're the same, haha. By the way, can you advice how to store the paste? Because it's not a store-bought product so I wonder how long we can keep it fresh? Can we keep in the freezer and thaw it when we are ready to use it? Thank you again naka for great recipes! Oh, I know that the accountant's life is not easy, haha, I'm lucky to work at home or I don't have time at all. About the paste, you can keep it in the freezer for 6 months or longer just taste it because the only problem for the paste is the rancid smelling that can happen when keeping the nut for a long time. Thanks for sharing the recipes however can i make the paste without the kirsch? Yes, you can omit the kirsch. your blog is fabulous. it has so much love attention for ingredients that it almost made me cry, I don't meet a lot of it where I come from. I was wondering if I can replace the Kirsch with any other drink? You can omit it or use cherry liqueur instead. I have one question,can I use instead of corn syrop,agave syrop or golden syrop?? Thank you for inspiring me!! I suggest using the simple syrup (the one that I have a link in the post) because it contains no smell that will cover the pistachio smell. i have loads of sevranome, you can get some or purchase it from me by 100g weights. I have checked the price of pistachio paste and it is really very expensive. 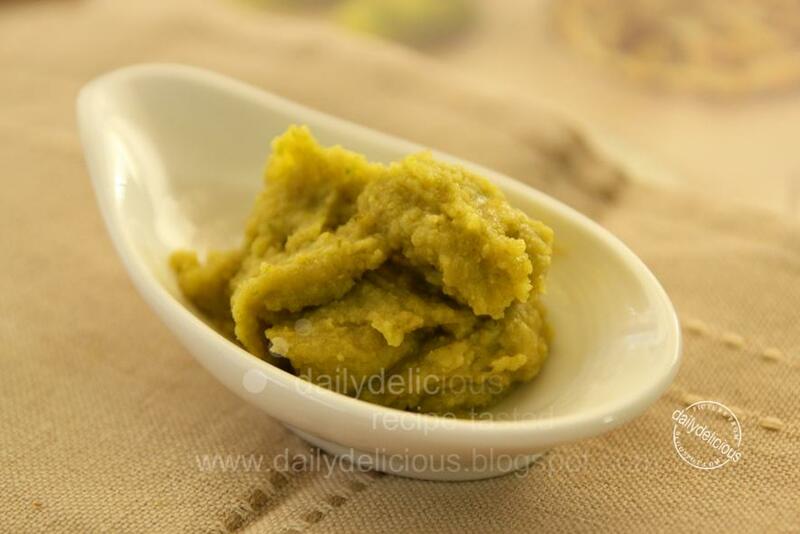 Thank you for the idea how to prepare homemade paste. I will definitely try it out. Great blog. Love it! Can I use this for Itallian Ice? Yes, you can use in any recipe that calls for pistachio paste. 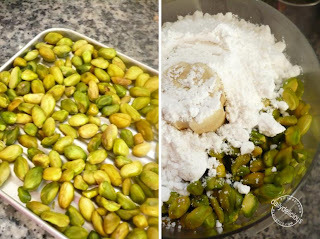 Can I knw when adding the syrup to the pistachio paste, do I need to heat up the syrup ? You don't have to warm the syrup before adding. Can I use a pestle and Mortar to make this or a smaller quantity? Nice blog, will look some more. Yes you can use pestle and Mortar but try to make it as smooth as you can ^^. I have just made a batch in the Pestle, it seems quite stiff. It tastes superb. Hard work, as are many good things in the kitchen. I remember reading about something similar with toasted coconut, to make kerisik. My paste is to be used in a Creme Bavaroise on Thursday. I hope it will dissolve in to the custard. I used stock syrup instead of icing sugar. Gordon Ramsay does this in his ‘Just Deserts’ book, this is a great book, combining classic technique, with Gordon’s beautiful creation. I will let you know how it goes. Thanks again. ^^, I think using syrup will be good too, and the paste will be less stiff, easier to work with. Well I did it; I ended up using a sieve, to stop ground nuts going in the bavarois. You were so right about smoothness. My Bavarois needed more Pistachio that is for sure. Pistachio was there, just not enough. Thankfully the use of vanilla in my custard saved the day. It was nice despite its faults. The colour was also nice. One other thing setting agents can cling to things like sieves. This is worth remembering. 2 sheets of gel. can become 1.5 sheets, 0.5 sticking to the sieve. can i use a salted baked Pistachio? im plan to make Pistachio ice cream. can i use salted baked Pistachio? i've got alot after CNY. 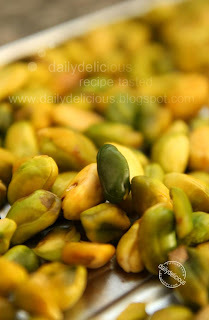 Planning to make Pistachio ice cream. The paste will be too salty ^^, I didn't suggest you to use it. your blog very helpful for me. As for the sieve/gel sticking, something I read. I am now not so sure, perhaps if you sieve to late? I sieved a pannacota cream fusion, Gordon Ramsay's recipe, there was no problem. Gordon does not do wrong. The recipe was from Far East Great Escape, Jasmine Honey Coconut with papaya and ginger compote. The result (now I have done it without mistakes) is amazing. For the making of simple syrup, can I omit the corn syrup since I do not have any? You can omit it, ^^. Thank -you! This was very helpful, and I was able to make pistachio paste for the first time :) I used it blended into pastry cream to make "pistachio" eclairs, topped with chopped pistachios. The recipe is from King Arthur Flour Whole Grain Baking. is kirsch necessary? i dont have any, is there a substitute for it? Kirsch adds more aroma to the paste but if you don't have it you can omit it. How long will the paste keep and do i store it in the fridge? It can be kept for 1 month.